PRE-ORDER HERE: Adventures of Captain Kimo T-Shirts & Hoodies! Click on the picture below, to pre-order a limited edition shirt to launch the start of our new comic series: Adventures of Captain Kimo. This t-shirt entitles the wearer of all bragging rights hereforth, therein, and soforth. To be the first, wearing the first, limited edition t-shirt of Adventures of Captain Kimo. 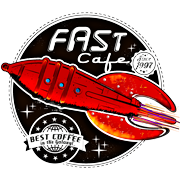 Subscribe to the blog at FastCafe.com to follow Captain Kimo as he travels the Galaxy. Subscribe to our newsletter to learn of the latest ADVENTURES OF CAPTAIN KIMO as he travels the Galaxy! Older →Adventures of Captain Kimo!